I’m just now getting around to putting these 13 decks back in their place. Yes, I do love to procrastinate! I did gather them and place them all with their respective deckmates right away, however, I left them sitting in stacks in a clear plastic tote until now. I truly enjoyed this exercise and have grown from it. Creating this collage finally got me blogging, I’ve gained a better sense of the type of card stock that I prefer (sturdy!) and while analyzing these card stocks I’ve become inspired to write a deck review or two. The latter prospect will have to wait for a spell, baby steps for now. I’ve also gained an awareness of just how spoiled I’ve become. At the start of my tarot journey I had two decks, The Wildwood Tarot and The Sacred Circled. I was grateful and happy with just the two. About a year in, I acquired The Rider Waite Smith and Thoth decks, mainly for learning purposes. I wasn’t quite grasping the card meanings from the Celtic versions. I then moved on to The Green Witch Tarot. This deck was most helpful to me. I really connected with it and was able to pick up on the card meanings with ease. My next deck was The Silver Witchcraft Tarot. Although this deck took me a bit longer to connect with, I was happy because I purchased it from someone that I truly admire and respect. I felt honored to have a deck that once belonged to my mentor. My tarot deck collection was slowly growing, adding next, The Tarot Illuminati, again for learning purposes. 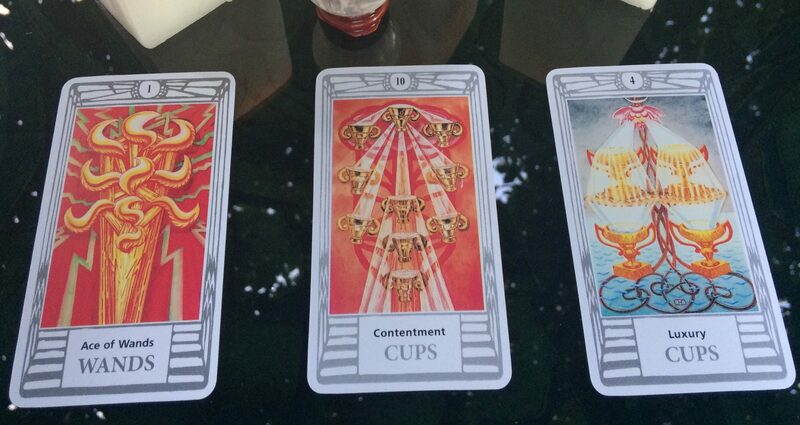 I had won a tarot course and this was the recommended deck for use and I understand why! My comprehension of the card meanings truly blossomed with the use of this deck. I’ve become a huge fan of the deck creators Huggens and Dunne. I’m especially drawn to Kim’s writing style and Eric’s artwork is beyond gorgeous! I’m looking forward to adding their latest deck, Tarot Apokalypsis, to my ever growing deck collection. I now own close to 50 decks! It’s crazy! I’ve truly gone mad! I barely use these decks! I only read for myself lately. (Aha! Writing this has sparked yet another idea! Stay tuned…) I feel grateful yet spoiled for having so many decks. Seriously, how many decks does one witch need??? Not only has my deck collection multiplied but so has my book collection! It’s Madness! I tell you! Pure Madness! Me silk? I’m more of a cotton kind of gal. Maybe some leather and lace. I read somewhere that silk was the old school material for protecting tarot cards from negative and outside energies. Old school it is! And hey, why not silk!?! I love this life and all that it has to offer! I’m enjoying it to the fullest!!! I’ve always been a simple low maintenance kind of gal. The little things are my treasures. The handmade gifts from my children, grandchildren, nieces, nephews, sisters and grandmothers are my favorites! I’ve come to learn that “Anything is Possible!”, “The Sky is the Limit!” and “I’m Worth It!”. Yes! I’m worthy of life’s finest gifts!